The creative application of technology can help you engage digital learners in content, reinforce skills essential to life in today's world, and, most importantly, require them to actively create rather than passively consume. There are plenty of conversations happening about how to engage today's digital learners, but it's important to remember that using technology is only one part of the solution. With the pressure of today’s classrooms, student use of technology needs to help them progress toward specific learning goals and should require them to apply what they know to create something new or solve a problem. The liberal application of technology for technology's sake is no longer sufficient. The following four ideas can help. Digital learners are idealistic and passionate about issues that affect them. Climate change, privacy rights and freedoms, and health and safety, are just a few topics that engage today’s students. Listen for the challenges and passions in your student population and see if they connect to content, ideas, or issues you want to address. You might consider having students create public service announcements to explore content issues in depth while practicing writing and communication skills. A public service announcement, or PSA, is a type of advertising designed to inform viewers about an issue and get them act or to change their behavior. Ellen Phillips and Marielle Crespo hooked their students using a fictitious letter from a local politician. After learning a local playground wasn’t clean or safe, students visited the site, documented problems they discovered, and worked in small groups to develop a series of PSAs to address the problem. When developing a PSA, students have a chance to practice and apply persuasive writing skills in a real-world, authentic context. A short PSA targeted at a particular audience encourages students to focus on writing organization, as well as voice and word choice. While project-based learning and authentic tasks are designed to forge a strong connection between what is learned in the classroom and why it is valuable in the world outside of it, there are other ways to make these connections. What do your students talk about or do when they aren’t in a classroom? How can outside interests be used to help them develop a deeper understanding of the curriculum or build important skills? For example, many science teachers have students explore the physics of sports when studying Newton’s Laws of Motion. When Tiffani D. Brown noticed that her middle school students were not engaged by daily journal writing, she made an effort to meet her students “where they already were — in the land of MP3s and YouTube — and [her] classroom was forever changed.” She didn’t abandon her curriculum or her learning goals. She simply took the time to find examples of popular music she could use for writing prompts that turned into discussions about symbolism, metaphor, and more. Read Tiffani Brown's story and learn her process. Students spend a lot of time watching TV. While it’s probably safe to assume that most students are not always watching high-quality educational programming, they have most likely seen great storytelling, watched news broadcasts that affected their mood, and watched a video biography on a person who interested them. Using a computer to fill out a digital worksheet isn’t any more compelling than using a pencil to fill out a paper version. Encourage students to show what they know, and capitalize on their interest in technology, by creating news broadcasts or video biographies on classroom topics using formats similar to those they see on screens outside of the classroom. Technology tools make it easy for students to create, rather than just consume, these types of media. Students often decide which movie to go see by watching trailers online. Movie trailers are fast-paced and exciting, conveying in just a few moments the details of a story while making the viewer want to see more. Instead of creating traditional book reports for Four ways to engage digital learnerss your students are reading, ask students to “sell” the books to other readers by creating movie-style trailers. Creating a book trailer helps students focus on key details, summarizing, character analysis, and writing, and the content of each trailer gives you an opportunity for you to assess reading comprehension. As they learn to think about and audience and how to change their behavior, they learn to write persuasively, a focus of the new Common Core State Standards for language arts. Explore the Entice Your Reader lesson plan. In the flipped classroom, students first explore a topic at home and then return to class to ask questions, address misunderstandings, and apply knowledge in a new project. To reinforce learning, especially for difficult topics, ask students to create learning resources like videos, animations, and tutorials for new topics and processes. When you require students to teach something to someone else, they must take the information apart and think about how best to share it so that it results in understanding. This process of deconstructing and reorganizing information helps students cement concepts and provides an opportunity for you to pinpoint misconceptions. Ask your students to tell a story. 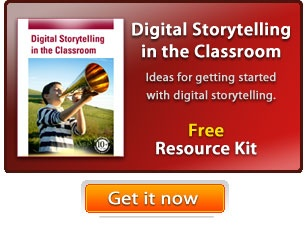 Digital storytelling is a great way to get them to delve deeper in the content you are studying. For example, have students create docudramas showing historic events or scientific processes through the eyes of a particular person or object. As they write the story, they not only show what they know about the content, they have a chance to apply everything they have learned about perspective, voice, organization, and audience. Rather than merely retelling stories, ask students to adapt, extend, or create new versions of books they are reading. Students can modernize a fairy tale to make it more relevant, comparing similarities and differences along the way. This instructional strategy is mentioned in Classroom Instruction that Works as well as a Reading: Literature standards in the Common Core. If we really want to give student voice a platform, we have to let them choose the story, the topic, and the characters. Adapting a book or story may be more engaging than just retelling it, but ultimately students need to tell their own stories. An autobiography is a great first step, but this should only be the beginning. If we want our learners to find their voice, we must give them less instruction and more well-crafted opportunities for learning. In the words of Gary Stager, "Good prompts do not burden a learner, but set them free."